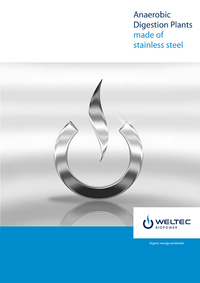 WELTEC BIOPOWER GmbH is one of the world's leading enterprises in the field of stainless-steel biogas plant construction. The company has planned, developed and built anaerobic digestion plants since 2001. Today, the medium-sized company has about 80 employees at the headquarters in Vechta, Germany, and has established more than 300 energy plants in 25 countries worldwide. The global distribution and service network spans five continents. The range of customers includes businesses from the agriculture, food, waste and wastewater industries. After a biogas plant goes live, WELTEC BIOPOWER offers additional support through its experienced mechanical and biological service team. The 24/7 availability contributes significantly to the efficiency of the plant. Nordmethan, a subsidiary company of WELTEC BIOPOWER, addresses another business area: The operation of biomethane plants and the provision of heat through energy contracting. In this way, the WELTEC Group covers the entire value chain of energy generation with biogas and biomethane ‒ from the plant construction to the plant operation.